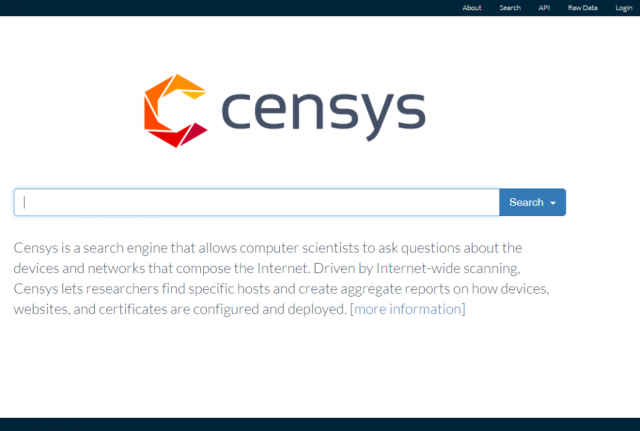 Censys Search Engine is a public host & network search tool that allows computer scientists to ask questions about the devices and networks that compose the Internet. Driven by Internet-wide scanning, it lets researchers find specific hosts with the networksearch and create aggregate reports on how devices, websites, and certificates are configured and deployed. Censys collects data on hosts and websites through daily ZMap and ZGrab scans of the IPv4 address space, in turn maintaining a database of how hosts and websites are configured. Researchers can interact with this data through a search interface, report builder, and SQL engine. If you simply search for a word or phrase, Censys will return any records that contain the phrase. For example, searching for nginx will return any records that contain the word nginx. Searching for 23.0.0.0/8 will return all hosts in that network. Censys data is structured and supports more advanced queries including searching specific fields, specifying ranges of values, and boolean logic. For example, you can search for hosts with the HTTP Server Header “Apache” in Germany by running the query 80.http.get.headers.server: Apache and location.country_code: DE. To facilitate complex questions that can’t be expressed in a single search, we also allow researchers to run SQL queries against the raw datasets and historical snapshots.